CIPET Admission 2018 - CPET is an autonomous institute under the department of chemicals and petrochemicals, Ministry of Chemicals and Fertilizers, Government of India. It offers various Undergraduate as well as Postgraduate Diploma courses. 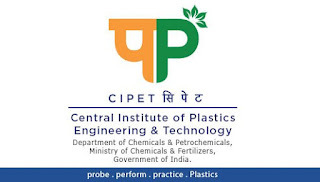 CIPET is the only institute of this kind in India where all facilities like design, tooling, processing and testing of plastics are available under one roof. CIPET B.Tech Admission 2018 is based as per the norms of the affiliating university and the B.Tech is offered in four CIPET Centers in India and they offer two specialisations in B.Tech and they are as follows. Candidates are strictly advised to read the application and admission brochure carefully available in the Web Portal before filling the online application form. The official web portal for CIPET JEE 2018 is http://eadmission.cipet.gov.in only for applying. No any other web portal is provided for submission of application into CIPET JEE 2018. CIPET will not be responsible for the candidate applied through any other web portal. There is no upper age limit for Diploma / Post Diploma / Post Graduate Diploma programs. Candidate / JEE aspirant can also visit the nearby CIPET centres for uploading JEE applications in the web portal. For admission to UG/PG programs, please contact the respective CIPET centres.